A little while ago I purchased Bakerella's Cake Pops cook book and just today I found out that they now have it available in Dutch! I love this book - so much fun. Many neat and sweet ideas galore. Yippee. Or shall I say hipierdepiep-hoera! Now, hopefully, very soon they - as in those people that sell stuff in the kitchen and baking stores - hopefully they will have candy melts and lolly pop sticks for sale. Because, actually I bought the book for a very good friend of mine that loves to bake. And she had a very difficult time making the cake pops with melted white chocolate. I guess melted white chocolate doesn't set the same was as candy melts. I'm kind of hoping to pick some candy melts up in the U.S. when I go there in the May vacation... and then, I'll get a few extra baggies for my friend and who knows - maybe I'll host a fun give-away for those of us on this side of the Atlantic. Because I know that even foodie bloggers in Germany can't even find candy melts. My friend also used popsicle sticks for the cake pops - and I'm sure that was still user friendly. It would just be nice to use the lolly pop sticks. I guess it's just a U.S. thing - or it's just way bigger in the U.S. than it is over here. But all things baking related are getting more and more popular here. I remember when I first moved here, I had to go to the Wal*mart in Achen, Germany to get all my special baking supplies. But now, I can find almost everything here. Another word of advice for any expats or other newbies here in the Netherlands: Baking soda in dutch is sold as "zuiveringszout" in the pharmacy. Or you can buy a big box of Arm & Hammer at just about any Chinese grocery store for way less. That's what I do! I haven't been following Angie Dudley's blog Bakerella for as long as it's been around. But I can tell you that I love her blog. She is so inspirational to many bakers, like myself. I've made cake balls a few times. I think the first time I tried making them was in 2009. After seeing how Angie makes them - I'm just so impressed by this lady's amazing talents. Mine turned out pretty good for being a newbie at making something for the first time. But it sure is nice to see that if you want them to look more perfect - all you have to do is put them on a stick and then put the cake pop in a foam block till it's completely dry. So simple and yet I didn't even think of it myself. 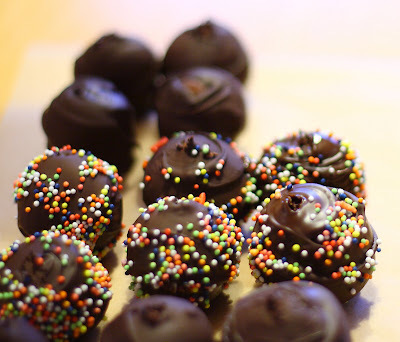 I used chocolate to dip my cake balls in because once again, candy melts are hard to come by here. By the way, they were delicious. A little timely to make but the taste was quite luxurious, rich, very chocolate-y and dare I say: better than cake. First time making cake balls - as you can see - where the toothpick was inserted in the cake ball - not so pretty - but the taste was not affected at all whatsoever! Second time making cake balls - mmmmm yummy - much better with white chocolate! I'm excited that this great little book is available in Dutch. It will be a nice addition to any cake lover - or cook book lover to add to your home library. just rolled across your comment on bakerella's page. Eindhoven is what caught my eye... i am originally from gemeente heerlen... Live now in Utah (Ogden area) And would go with my mom and dad to the Eindhovense conferences. Small world. And so much fun to read your blog. What made you go to the Netherlands? Still so so cool to come across your blog...! Is the Arts family still there? And the Van De Vlis fam. I used to hang with a girl named Thera van de grif... i think her maiden name was vd graft... oh... it's been a couple of years... ( like 25) My maiden name was Haan. My dad was district and before that gemeente pres. in Heerlen en Eindhoven district. My email address is elsmanning7@yahoo.com... let me know? Tot horens!? Just wanted to come by and say hi! Thank you for following and the nice comments you left! I really appreciate it! God Bless! Hi, I found your blog trough the mormon.org site. Nice to read your story. I'm a member in the Rotterdam 1 ward. Was just going trough your blog when I saw the cake-pops. They are excellent and really nice - I give workshops in making cakepops;);). A small world!